the torture and murder of innocent civilians, families torn apart; the destruction of private property, infrastructure, livelihoods, and local culture; the installation and propping up of plutocratic dictatorships that often end up turning on the United States; increased animosity toward the Unite States that makes us less secure; deficits, debt, higher taxes and inflation, wasteful consumption of capital, distorted markets as well as the loss of liberties and the erosion of a liberty-loving culture back home; lonely spouses and children growing up without their fathers or mothers; personal trauma, both physical and psychological, and the corruption of one’s character. So what would our libertarian and other antiwar readers suggest? Particularly any of you who have military experience? io9 doesn’t appear to be limiting suggestions to science fiction, since they mention “supernatural romance” and open the door to “something totally different.” Feel free to suggest works of fantasy, horror, or another genre. Any medium. Offer your suggestions in the comments below. Let’s put together a list of must-read and must-watch science (or fantasy, or other) fiction for those who are “serving” in the military, undermining our freedoms and making us less secure. Before recommending a few books, I first want to acknowledge that this would be a challenging situation for someone already in an armed force who has thus far believed the ideological supports for militarism and is already on the ground participating in it, and then starts to question it from an awkward position within the “belly of the beast.” It is certainly better than waking up among the threatened and occupied victims, but it is still a version of waking up inside a nightmare if you had really believed you were going to be doing the right thing. Then there are multiple layers of history-tested systems for convincing young men of these things and then for heading off risk of subsequent reflection that might undermine the dogmas, so this is no easy thing to see through (unless, of course, you have already once seen through it, after which it is right there before your eyes). 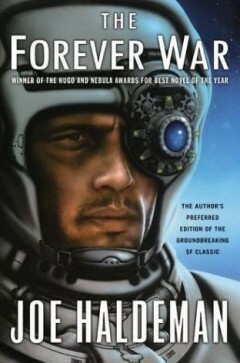 That said, a couple of sci-fi war stories that try to encourage reflection on the nature and psychology of war itself come to mind and these are Forever Peace by Joe Haldeman and the combination of Ender’s Game and Speaker for the Dead by Orson Scott Card (particularly the juxtaposition of the two books creates an effect that could kickstart a reflective process). A follower of The Libertarian Standard on Twitter suggested Warhammer 40K. And, on Facebook, a former fellow grad student suggested on The Odyssey and the essay “Cortes in Darien” by Alan Farrell relating it to his experiences in Vietnam. Someone on the LvMI fan page on Facebook recommended Roadside Picnic by Arkady and Boris Strugatsky. I think Ender’s Game has a very good message to it about what the military can do to people, even those it doesn’t kill. I personally did not think the book was that good, but I seem to be in a minority on this. The Forever War and Forever Peace have a strong anti-war message and are far better novels, in my opinion. Many people call The Forever War an updated version of Starship Troopers. There are many similarities, but Starship Troopers was ultimately pro-military. Slaughterhouse Five is an excellent book with an appropriate message on the subject. Also worth reading is Vonnegut’s essay on the experiences he had in WWII that formed a basis for much of SH5. There is not a whole lot of sci-fi I have read that is strongly anti-war. My favorite work with an anti-war message would be Paths of Glory, directed by Stanley Kubrick, though it’s neither sci-fi nor novel. If I can add one more title to round out the list, my own book Withur We is an anti-government science fiction novel, and the anti-war aspect of that message features prominently. The US attack on Iraq was part of what compelled me to write it.